The cluster house (Charles Bage, England), le carre mulhouse (Muller, France), the quadruple house (Frank Lloyd Wright, US) – different names for a type of house that did not quite catch on anywhere in the world…….except perhaps in Malaysia. It is not that this house-type is common, but developers here have been building cluster houses since the 1970’s. Initially, they were low-cost houses, but lately they have tended to be priced in a more expensive category – cheaper than semi-detached houses, but more expensive than terrace houses. In Maran, a district town in the state of Pahang in Malaysia, I have designed a cul-de-sac neighbourhood right next to the town-centre. 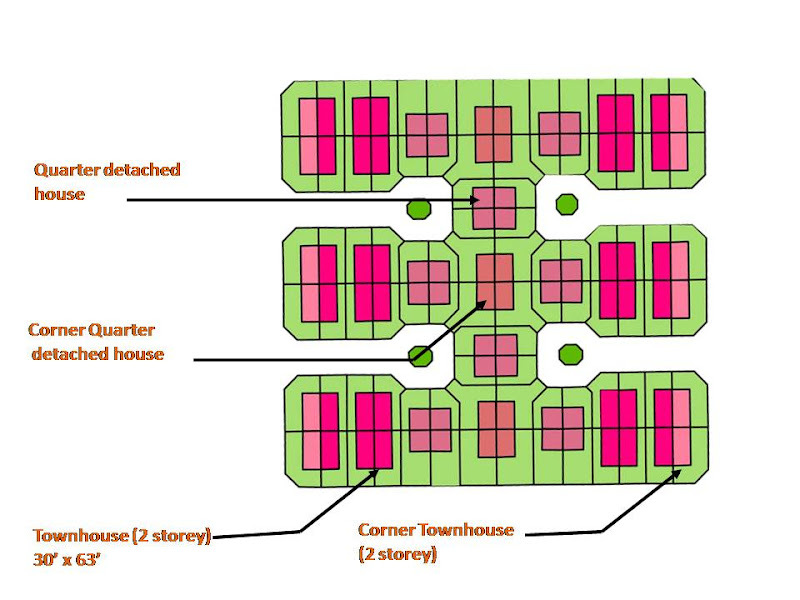 In this layout are “quarter-detached houses” - the same concept with yet another name (sorry). Then there are the “corner quarter detached houses”, a close relative of Frank Lloyd Wright’s quadruple house: viewed from any one driveway, you see a unit that looks like a detached house! There are also “garden townhouses”, much like the quarter-detached houses, but with separate units upstairs and downstairs; and with each unit having its own garden and private car porch. There is a variant of the garden townhouse when it is located at the corner of two streets. I would love one here in Moscow all we have are Flats. Any single family dwelling is out of city limits. Kuala Lumpur has the advantages of being a small city of about 4 miilion. I live in a "kampong baru"(new village) community 15 minutes from the city centre. But I don't get to walk to work!